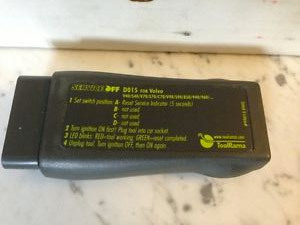 The AST 5408 resets the Service light on Volvos via the OBD-II port. It's for loan for a small deposit. The AST 5408 resets the Service light on Volvos via the OBD-II port. My 1997 Volvo 850 requires this tool, for instance, but most other models don’t. See if your Volvo allows you to reset the Service light without this tool. This tool is analogous to the Draper service light reset tool — it does the same thing. $60 deposit – forfeit if it breaks or doesn’t get back to me. This is refunded 100% when I get it back. $5 “entropy fee” – one day it will break, so this goes toward buying another in a year or two – not refunded. Total PayPal deposit required: $72. My suggestion is to snap a photo of it when it gets to you and snap another photo right before you put it in the box on its way back to me. And to be extra careful, one of the box addressed to me. Please don’t keep it for more than a week, not including shipping.